For most fathers, the day we find out God has blessed us with the gift of a child is the start of many days and nights of dreaming about them being our lifelong fishing partner. Snoopy fishing poles find their way into our garage well before our little ones can hold or cast them, because we want to be ready for the day they get introduced to fishing. 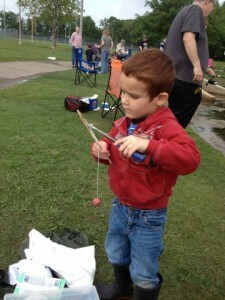 When is the right time to take your son or daughter on their first fishing trip? The answer is when YOU are ready! 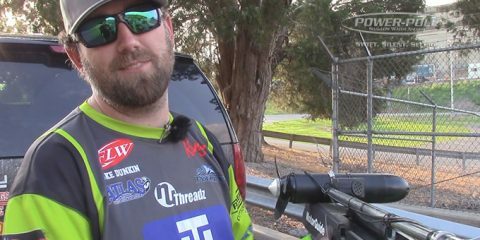 That doesn’t mean their first trip should be out in the boat for an all-day fishing trip, nor does it mean stick a rod and reel in their hand and a bucket of crickets at their feet for a eight hour freezer filling bedding brim trip. “When you are ready” refers to when you the parent are ready to put down your rod and reel, forget about making a single cast, have the patience to let your child explore the outdoors at their own pace, and not force your desire for them to catch fish. You should be ready to spend the day focusing on your future fishing buddy to make sure he or she is having fun in the outdoors, even if that means they don’t have a rod in their hand. 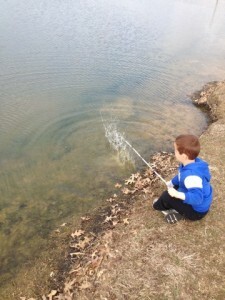 We are walking a tightrope when introducing our kids to fishing. 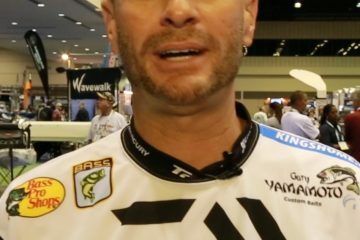 Push the actual fishing aspect too hard, too fast and you can drive them away from developing any interest in fishing. Quite naturally kids want to be just like dad, when dad goes fishing junior wants to go as well, in theory… Once at the lake or pond the desire to catch fish the little ones once had will quickly switch to the unstoppable urge to play in the water, throw rocks, catch turtles, and sword fight the bushes with sticks (or their new fishing rod). miserable experiences either of you could have together. Remember actually fishing and catching fish should take a back seat to spending time with them in the outdoors, their desire to fish will come in time. Even toddlers know dad has gone fishing and maybe even express a desire to go with you. Now is a good time to introduce some aspects of fishing to them by letting them climb aboard your boat (with close adult supervision and of course no rods or hooks on the deck). To your young child the boat is a giant jungle gym and what kid doesn’t love a jungle gym? As an example at two years old my son Luke figured out how to use the passenger rod storage ramp on my Bass Cat Puma as a slide. Now at four years old he still loves to play with the leftover ice in the cooler, and holds the water hose when I am cleaning out the live wells. Kids love to sit in the boat and “drive” even in the driveway or garage, so when preparing before a fishing trip or cleaning it up after a trip let them have some time behind the wheel . Be forewarned they will immediately find the horn button and it will become their favorite button to push repeatedly. A little tip, a shop towel gently tucked into the horn will help you keep your hearing intact! Neighborhood ponds or local parks are a great place to introduce your little one to the water, especially if they have a playground. 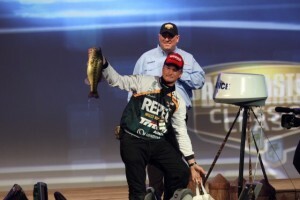 Take your fishing rod but don’t expect to get much serious fishing done. If you happen to catch a fish encourage your little one reel it in. Limit fishing to 20 to 30 minutes to start with and use the playground as a reward for them at the end of the trip. As they get a little older you can start practicing casting with them in the back yard. An inexpensive closed face reel with a rubber casting plug will work just fine to help them learn casting mechanics. Set up a target so they have something to aim for, and be sparing when critiquing their technique. If every cast is met with a criticism they will quickly loose interest. As their proficiency gets better you can let them take their own rod to the local park pond and make casts. Keep in mind treble hooks and kids don’t mix well. 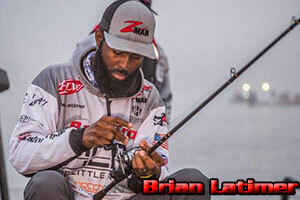 Let them use their casting plug, a single hook bait like a Strike King spinnerbait ,Texas rig a Rage Tail worm, or a Jewel Bait Company football jig and give them plenty of casting room. 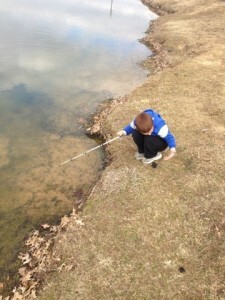 A final word of caution when kids start casting baits with hooks – You are the one most likely to catch an errant hook. Be sure you have on protective clothing. At the very least a hat and sunglasses should be worn, long pants and long sleeve shirt will add another layer of protection. Encourage your fishing buddy to do the same. Clipping and filing the barb off the hook will make removing the hook much easier if an errant cast finds your leg. application on the kids and I get to wash the chemicals off my hands. Wet Wipes are invaluable and available in small travel sizes that will fit in your tackle box or back pocket. These are great for a variety of things from cleaning off juniors hands when he picks up goose poop, cleaning a sweaty face or scraped knee, and are easier on the bottom than toilet paper. Many towns host catfish rodeos in the spring. These corporate sponsored events are usually free and typically have lots of prizes and giveaways for the kids. They usually only last a few hours, and some even provide lunch. Kids compete with others in their own age group, but everyone usually takes something home. The smile on the kids’ faces when presenting the fish to be weighed in is priceless whether it be one fish or a full stringer. 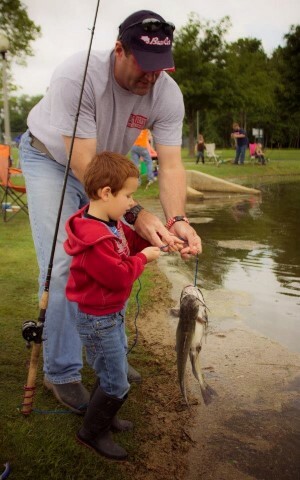 A catfish rodeo is a great way to spend a Saturday morning fishing with your child so this spring find one to attend, load up your lawn chair, a few tubs of chicken livers, and go have fun with your kids! When you decide it’s time to take your little buddy out on the boat be sure you have the proper size and type of life jacket for them. In the water, kids could slide out of an adult size life jacket. 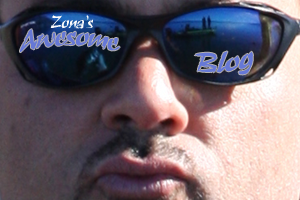 Life jackets are relatively cheap so please don’t overlook this important safety device. 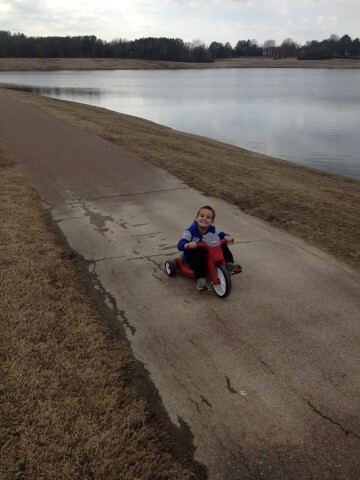 Be sure to set a good example and wear your lifejacket, at least while the gas motor is running. Read up on your local boating regulations. Some areas require children 12 and under to have their life jacket on at all times unless anchored, which is a great idea even if not required by law. When boating with your little one be prepared to move around regularly. Smaller children do not have the patience to sit and cast for long, most prefer to be on plane with the wind in their face. Take plenty of drinks and snacks. Having a video game or two for them can extend your time on the water. Watch the forecast for favorable weather, and pick a good warm light wind day. Keep the trips short and keep the kids thoroughly covered in sunscreen. Remember actually fishing and catching fish are way down on the priority list. Keep a close watch on your little buddy, it will be pretty easy to see when they start to lose interest. When you see their interest waning, make a change, move to the playground, or take them back home. A ice cream stop after the fishing trip will almost guarantee they will want to go again. Most importantly have FUN with your future fishing buddy, and as always put the kids first!